Saddle shoes were all the rage in the 1950s. 1 What Did Teenagers Wear in the '60s? When a child complains about dressing up for a formal occasion remind him what life was like for kids in the 1950s. Girls wore dresses and boys wore jackets and ties to school each day, as well as for most social events. Kids wore dress shoes everyday with these nice clothes, and rarely wore sneakers out of the house until late in the decade. Saddle shoes are the quintessential image of a shoe in the 1950s, and with good reason. Girls wore them all the way through their teenage years with any dress except their most formal. They wore them with dresses, skirts and even with jeans, or dungarees, when they came into vogue. Young boys wore them too, but older boys often did not. The classic shoe was white with a broad black section across the top of the instep, like a saddle. They laced up and were quite sturdy and heavy, with a rubber heel. Buster Brown shoes had been around since the late 1800s and were a huge hit with kids in the '50s. Buster Brown was a character from the comics, and became the logo for the Brown shoe company. Young boys and girls loved their Buster Browns. The shoes came in many styles, from casual to dressy. 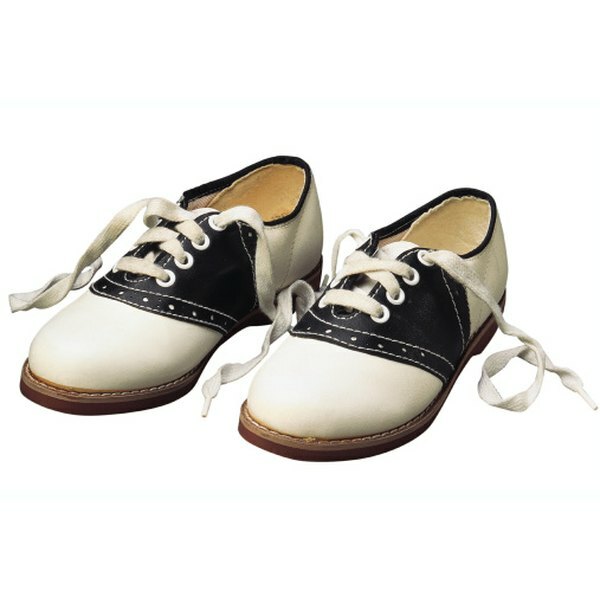 A common Buster Brown shoe for girls was a slip on shoe with a round toe and a buckled strap across the top. For boys it was a lace-up, round toe sensible shoe in brown or black. Many kids wore Buster Browns to school. Older children wore shoes more similar to their parents' styles than to Buster Browns. Teens dressed in quite grown-up fashions and grew up quickly, often marrying and starting families before they were 20. Teen girls usually only wore heels, though, for dressy occasions such as parties or dances. For school or a casual outing they often wore slip-on ballet flats with demure bows, or strappy sandals with a small heel and rounded toe, as opposed to the stilettos that older women wore. Teen boys wore lace-up dress shoes with more of a pointed toe, many wore wing-tips like their fathers. Sneakers came into vogue just in time to pair with jeans which were becoming all the rage for girls and boys. Girls also began wearing pedal pusher pants which were tight and came to mid calf. Neither big, clunky dress shoes nor heels looked right with these styles. They began wearing what are now known as Ked-style sneakers. The shoes were made of canvas and rubber and were lightweight. High top sneakers became trendy as well and boys wore this style. Converse All-Stars had been around since the 1910s, but had usually only been worn for athletics before boys began wearing them in the '50s.